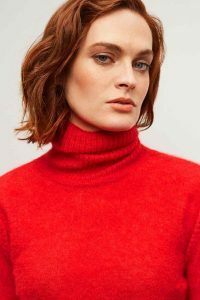 As crisp autumn days are upon us and cold dark evenings draw in, there is nothing more I like best that cosying up in a roll neck jumper to shield away from the cold chill. A knitwear piece that is effortless, protective against the winter winds, chunky and cosy or fine and delicate, there are so many ways to style this champion of winter knitwear! Below I share with you my inspirational street style to show you how you can wear your favourite Roll neck, from work to weekend, from day to night. Layer over silky dresses in contrast colour blends a la VB with contrast textures, colour clash and neutral palettes. So many ways to wear the Thame Chunky Turtleneck Jumper, I personally love sequins with chunky knits, even in the day! Tuck into high-waisted skirts for an elegant silhouette or layer under your favourite slip dress for a more casual look. Pops of colour add a luxurious edge to a fine knit jumper and a great way to introduce a new colour into your winter wardrobe. Throw on top of tailored trousers for work, for an effortless, powerful look, and let’s face it, ultra cosy. Tuck into a high waisted leather skirt for the evening, such a striking outfit with the mix of textures. The perfect Roll neck to take you from work to cocktails. 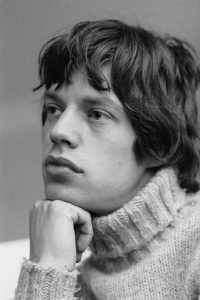 Iconic Brits in the roll neck sweater, timeless style at its best! The chunkier the knit the better, embracing sweater weather and the perfect sweater to borrow from the boys.